King Edward VIII at Abertillery. In November 1936 King Edward VIII announced he would visit the district during a two-day official tour of South Wales. On Wednesday 18th of November, the first day’s tour would begin at Llantwit Major and end at Penrhiwceiber with the route through Merthyr Tydfil. On Thursday 19th of November the tour would begin at Llantarnum, at Llanfrechfa the King would inspect a Junior Instructional Centre, on to Pontypool for an inspection and to visit a Boy’s Centre at Snatchwood, later to visit the Peter Scott Welfare Centre at Blaenavon. From Blaenavon he would drive to Abertillery and visit the Glebe Recreation Ground at Gelli Crug and Rhiw Park to inspect the site of the Improvement Scheme, undertaken by the Arbertillery District Council with a grant from the Special Areas Commissioner. The word Glebe as in Glebe Land is defined as an area of land within an ecclesiastical parish used to support a parish priest. The Rhiw Park project was completed within an improvement scheme, which had been contemplated before the Great War, though owing to the hostilities it was held up and the following industrial depression prevented the council from proceeding with it. Later on the passing of the Special Areas Improvement and Development Act of 1934 a representation was made to the South Wales Commissioner Captain Geoffrey Crawshay which resulted in a £4,000 grant being received from the Special Areas Fund. The money received went towards the draining the Rhiw Park tip, to prevent further flooding of the streets in its vicinity, levelling and turfing the top area and converting the site into a beauty spot. His Majesty was expected to arrive at the ground before 1.30pm. Admission to the ground was by ticket only, issued by the committee, with the number limited to just 250 available only to members and patrons. It was reported that the police were anxious that the 10 mile route between Brynmawr and Crumlin, which the Royal car would follow be kept clear and appealed for the assistance of ex-servicemen, friendly societies, scouts etc who could provide batches of men who would volunteer their services to supplement the police officers in lining up the crowds in possible congestion spots. Each volunteer would be recognised by a red armband, the distinctive mark of authority. The route the Royal car would take was to the Glebe from Brynmawr via Roseheyworth Road, Gladstone Street, Foundry Bridge, Tillery Street, Newall Street, Gellicrug Road, Clarence Street and into Roch Street. From the Glebe the King would go to Rhiw Park via Bishop Street, from Rhiw Park back through Bishop Street, Newall Street, Tillery Street, Church Street, Somerset Street and down Alexandra Road to Aberbeeg, Crumlin, Newbridge Pentwynmawr, and Pengam and on to Rhymney. On Tuesday 10th November 1936 Mr G. A. Moxley presided over a meeting of the Abertillery Shopping Week Committee at which he recommended that all business premises be closed between the hours of 12.00pm and 3.00pm the following Thursday on the occasion of the Kings visit and that all traders in Abertillery be requested to decorate their premises with flags and buntings. The chairman of the Abertillery District Council also appealed to the residents of houses along the route to decorate their houses with flags and bunting in honour of the Royal visit. If any organisation was able to provide volunteers they were to inform Supt R. Baker at the Police Office at Abertillery or Inspector E. Davies at Blaina or P.S. J. Haskell at Llanhilleth. On Thursday 19th November the King came to Abertillery as planned. His Majesty was accompanied by Mr Ernst Brown the Minister of Labour, Sir Kingsley Wood the Minister of Health, Captain Geoffrey Crawshay the District Commissioner of the South Wales Special Areas, Mr R. Pierce Jones O.B.E., Divisional Controller of the Welsh Division Ministry of Labour and Mr George Daggar M.P. 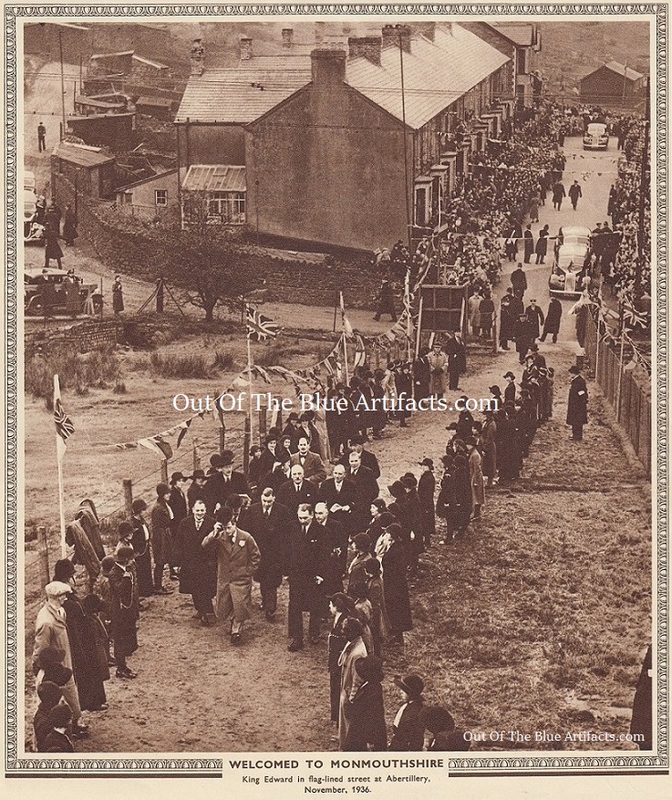 The King came to Abertillery after a stop at Blaina, the three streets nearest the Glebe Ground were lined with children, who were all given flags to wave, with over 6,000 being issued. At the gates of the Glebe the King was met by Mr W. F. Forrest of the District Commissioners Office who escorted the King to the sports field. After acknowledging the crowd the King was interrupted by the arrival of a telegram which was delivered to the King by G. E. Huntley of West Side, Cwmtillery, a junior member of the Post Office staff. Once at the Sports Ground Captain Geoffrey Crawshay presented officials, workmen and others. The first to meet the King’s attention were a group of men engaged in removing earth from the site. The King spoke to Mr T. Davies of Gwern Berthi Road, Cwmtillery, who said he was an ex-Serviceman having served in the Kings Light Shropshire Infantry and was still on the reserve list. Next was Mr J. Selwyn who explained they had been working on the project for three years. Another group of men working on excavating ground was questioned by the King mainly on the effects of the unemployment. The King looked up at the Olwen Colliery in the distance and enquired whether all the waste tips in the area had come from the one colliery, the Olwen Colliery? The King was informed that many other collieries, long since closed or idle had contributed to the slag heaps. Mr J. Downes informed the King that there were three collieries in the town idle with only Cwmtillery and Six Bells at work and His Majesty was shocked at this and seemed unaware of the true extent of the unemployment situation in the valley. The King then sat in the brick building that was erected on the Glebe Ground, paid for by funds from children’s concerts and subscriptions. He spoke to Mr Tom Gravenor who informed the King that he had not been employed for nine years and that he hoped the Royal visit would result in improved conditions in the areas affected, the King replied “I hope so too!” and left the grounds to visit Rhiw Park. The spectators sang “For he’s a Jolly Good Fellow” and the children singing “God Save the King”. The Kings second stop was at Rhiw Park, there he inspected the Abertillery Education Committee’s School’s Provision of Meals Centre and the Rhiw Park Recreation Ground, there he was met by Mr W. Beynon J.P. (Chairman of the Abertillery Council), Mr D. R. Davies the (Clerk), Mr Tom Gale, Dr T. B. Smith, Mr D. T. Evans the (Manager of the Abertillery Labour Exchange), Mr W. B. Harrison and other members of the Abertillery District Council. Also present were Mr Trevor Mort the (Chief Colliery Manager of the Ebbw Vale Collieries), Mr Cyril Watts (General Manager of the Messrs Richard Thomas and Co Ebbw Vale), Mr John Phillips (President of the Abertillery Branch of the British Legion), Mr W. Frowen O.B.E., J.P. Mr J. Cool (Chairman of the Ebbw Vale Council) and Mr H. E. Badmington a (Magistrates Clerk). His Majesty was shown into the Rhiw Park Feeding Centre where 40 children from Gelli Crug and the Church School were being fed – Pea soup, meat and bread pudding, served on plain white tables without table-cloths. After chatting to several children the King spoke to Mr Frank Thomas the supervisor of the centre who were wearing several medals he had received in the 131st Field Ambulance 38th Division. Mr Thomas was asked of his experience in the 38th Division and then asked how many meals were being served to each child and he replied two meals daily, the children were in the charge of Miss Warfield and Mr Worthy Richardson. The Naming of the Children’s Park. Upon leaving the Rhiw Park Feeding Centre, the King was escorted to the Rhiw Park and was told it was for the exclusive use of the children, at this point Mr Beynon then requested the Kings permission to regard the visit as the opening of the ground and also to name it the “King George V, Children’s Playing Ground” with which the King granted this permission. At Rhiw Park, His Majesty inspected 23 unemployed men, some of whom were wearing army medals, he spoke to four of them as follows – Mr Robert Williams of 13 Cross Street, Abertillery, Mr Richard Hathaway of Glantorvan Terrace, Penybont of the Kings Royal Rifles, Mr Hathaway was wearing a Scarf that had been knitted by the Duke of York. Mr H. J. Moore of 1 Cross Street, Abertillery and Mr Bert Eadie of Tillery Street. Before leaving Abertillery the King also spoke to the Right Hon. Mr W. Brace and Mr W. B. Harrison. The spectators sang “God Save the King” as the King drove away. It was later reported that the whole of the area had made the Kings visit a special occasion and the town and outskirts had been highly decorated. Every shop had been adorned with Union Jacks and red and blue trimmings. The Abertillery Police Station was covered with huge flags and banners were draped across all of the streets. 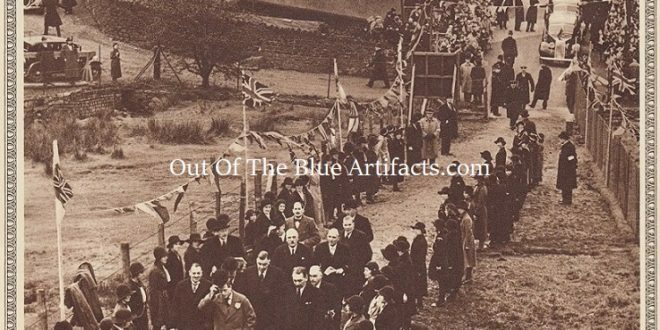 The Pit-Head at Six Bells Colliery flew a banner reading “Rule Britannia” with collieries at Crumlin and Newbridge flew similar flags and banners. Abertillery also hit on the idea of saying Hello and Goodbye to the King, Roseheyworth Colliery flew a banner which read “Abertillery Welcomes Your Majesty” and at Crumlin a similar banner read “Abertillery Thanks Your Majesty” in between the War Memorial at Abertillery had a banner reading “Long May He Reign” and in all it was stated that thirty miles of decorations were used to welcome the King. The police later reported that from 8.00am people had poured into the district in buses, cars and trains, people were twenty deep in some places of Abertillery to watch the passing Royal car. It took 10 minutes to walk through Church Street, even though there were 600 special constables enrolled at Abertillery and 60 at Blaina. Police from Swansea and Cardiff were drafted in and they numbered 250, there were no problems and the crowds were said to have been orderly. The Boy Scouts and ambulance volunteers who help control the crowds were allowed to keep their red armbands. It was said that Mr Hannen Swaffer and Mr Trevor Wignall, the well known writers were in the crowd. The South Wales Miners Fund. During King Edward VIII’s reign a fund was set up for the Miners of Wales, souvenir items related to the Prince of Wales was sold in aid of the Welsh Miners Fund. Below is a link to a tin of Edward VIII Lapel Badges (in my personal collection) originally sold at 2d. (pence) each, all proceeds to the fund. Notes of Interest – Mr Edward Frost. Upon hearing of the Kings visit to Abertillery, ex-serviceman Mr Edward Frost, who was living at 66 Gladstone Street, Abertillery, which was on the route of the Royal car, got out of his bed through illness and insisted he dress in his Zulu Natal uniform and greet the King as he drove past. Mr Frost stood on the curb outside his home in Gladstone Street as the Royal entourage approached but as the car passed Mr Frost the King looked the other way. Mr Frost’s friends and relatives wrote a letter to Buckingham Palace to express their anger, though the King wasn’t aware of Mr Frosts presence that day or that he had ignored Mr Frost. The King immediately sent a letter of apology to the family for any distress caused. Mr Edward Frost of 66 Gladstone Street Abertillery was born in 1852 at Gisburn, Bradford, Yorkshire. He enlisted in 1870 with the 8th Regiment Of Foot and later joined the South Wales Borderers. He saw active service in India in 1870, fought in the Zulu Wars, Natal at South Africa in 1879, East India in 1880, Burmah – Burma in 1886 and Malta in 1888. Throughout his time in the army he became a very learned man and gained a 3rd class Education Certificate in 1877 and a 2nd class Certificate in 1882 and became Sergeant. He obtained distinguished service medals in Zululand Natal, and Burma, also a long service and a good conduct medal in 1889. After a long career in the British army he came to live at Llanhilleth with his wife Alice May and was the Steward of the Conservative Club, Llanhilleth. At the outbreak of the Great War Mr Frost was put in charge of the recruiting office at Llanhilleth. His son, Mr Alfred Frost joined up and was put into the 2nd Mons Regiment, he was sadly killed in action. After the war in 1918 Mr Frost came to live at 66 Gladstone Street, Abertillery. Mr Frost sadly died on May 2nd 1938 aged 86 and was buried with full military honours at the new cemetery Brynithel. At the funeral, his coffin was covered with the union flag and placed on top were his Medals, his (old pattern) Helmet, Belt and Side-Arms. Before his death he was the oldest ex-soldier in Abertillery. As the King drove through Six Bells after his visit to Abertillery, Mr Richard Christmas Morgan a prominent Six Bells business man caused alarm on Alexander Road by attempting to stop the Kings car. Mr Morgan had in his arms a fifty-guinea Pekingese puppy dog called “Mickey” and he wanted to present the animal to the King in appreciation of his Majesty’s visit to Six Bells. Mr Morgan was not successful in his efforts and the Royal car did not stop.